Purpose of Wildlife Management Area: Conservation of critical, internationally significant habitat for year-round, migrating and wintering waterfowl populations, along with important fish and marine mammal habitat. 1 km south of the City of Delta, surrounding portions of the Serpentine and Nikomekl Rivers. Important year-round habitat for many bird species, Boundary Bay is also a vital link in the Pacific Flyway, supporting over 1.5 million birds from three continents and 20 countries. The Boundary Bay, Sturgeon Bank and South Arm Marshes Wildlife Management Areas have been designated as Western Hemisphere Shorebird Reserve Network sites. 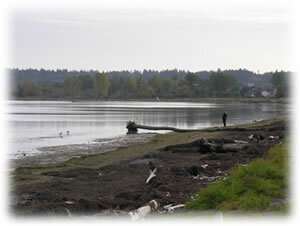 As part of the larger Fraser estuary, it supports the largest wintering shorebird and waterfowl populations in Canada. The area also provides habitat for significant numbers of raptors and marine mammals. Common species in the WMA include Mallard, American Wigeon, Brant, Great Blue Heron, Black-bellied Plover, Dunlin, Western Sandpiper, Mew Gull, Rough-legged Hawk, Red-tailed Hawk, Northern Harrier, Peregrine Falcon and Bald Eagle. The last Canadian nesting population of Barn Owl is concentrated in the Fraser delta, and forages in the Boundary Bay area. The bay supports nearly two-thirds of the Fraser estuary’s Harbour Seal population, attracts Grey and Killer Whales, and provides nursery and feeding areas for salmonids. The eelgrass beds are important spawning sites for Pacific Herring. The WMA is made up of intertidal salt marshes, mudflats, and open water marine habitats. The salt marsh habitats support large Salicornia spp. (Sea Asparagus) communities, as well as various grasses. The low intertidal zones support extensive eelgrass beds. Small amounts of commercial harvesting of Salicornia are currently allowed within the WMA under permit.